Happy Monday, everyone! Whether you’re back at work or still enjoying the long President’s Day weekend, I hope your week is off to a great start. 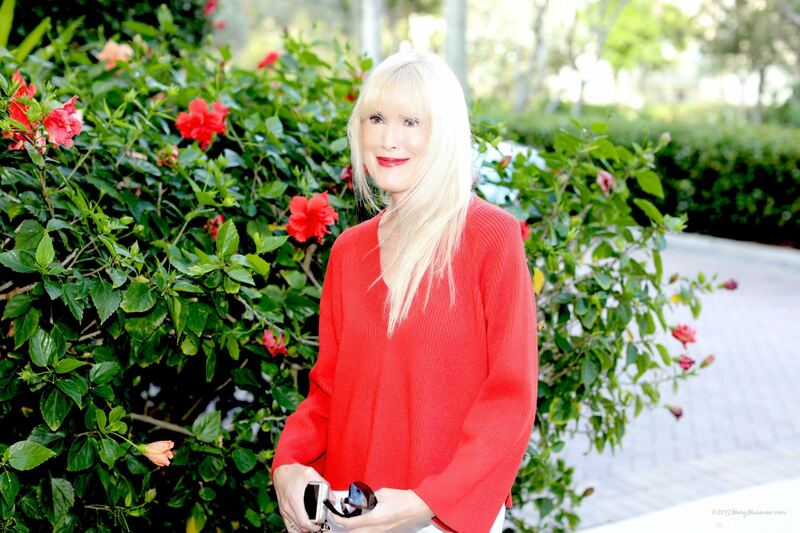 In homage to the season of love, I’ve reached for a shade I don’t normally wear – red. Not just any pop of color, red is one of those rich hues that immediately injects a bit of drama into any look and definitely does not go unnoticed. This Frame sweater in addition to being bright and bold has the kind of modern details I love – bell-shaped sleeves and a comfortable, cropped silhouette that’s as versatile as it is on-trend. 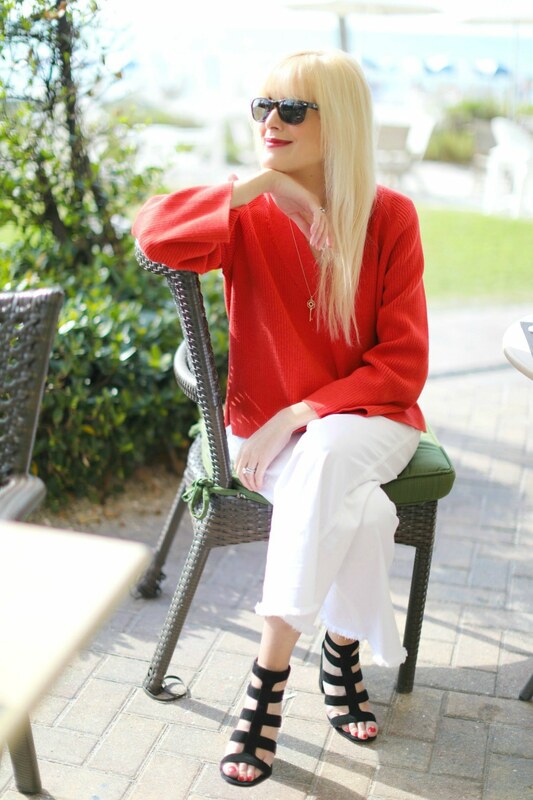 Love that it’s a year-round wardrobe staple that can be dressed up or down and paired with multiple pieces from my closet -denim (white, black, blue), Khaki’s (Wide-leg or cropped), trousers and skirts – this sweater just could convince me to wear red more often. How would you style this stand-out sweater? Great look…you should wear red more often…. Thanks so much, Ivey! And yes, over a slip dress is another great look! You look beautiful in red. You styled the sweater perfectly with the white pants. I would wear it on white as well or blue jeans. Well if this gorgeous sweater hasn’t convinced you to wear red yet, I hope I will. You glow in this color Mary. Love how chic and elegant this is. The sandals and necklace are beautiful! Hope you stop by this coming Thursday and linkup with me, beautiful Mary. =) Have a great week! Red is a great color on you — definitely an elevated classic! I would style this sweater with black jeans or leather leggings and a single-strap black sandal. Definitely a standout sweater! I love how you styled it with the white culottes. Red is a stunning color on you and you definitely make a statement in this outfit! Love how you styled it with the white pants and those chic shoes! Thanks so much for sharing at On Mondays We Link-Up :). Hope you have a wonderful week, gorgeous!!! Red suits you really well Mary. It works perfectly with your hair and skin tone and those white jeans are fabulous partners to it. The sandals are a great addition to keep the look on trend. I don’t really wear red, but this top would work well with a slim black pencil skirt I have, finished with some heels for a real va-va-voom! This sweater is just stunning on you and love it with the white denim!! This post has me wishing for spring! Very nice. It comes together beautifully. Mary, you look stunning in red! Love this entire look! Beautiful. You have gotta nice smile dear..
You look lovely in red! Love this effortless look! Love the white pants Mary, the cropped look with those gorgeous sandals is lovely and very Spring ready. Red is a fab color on you, great with your skin tone! I love your red top, girl! :) Stay pretty! You look great in this red! Thanks for linking up to Fablulous Friday. That particular red is great on you! And looks so crisp and fresh with white and those fab shoes.